Amsterdam, The Netherlands - Make bedtime something for children to look forward to with the new Philips Disney SoftPals range. 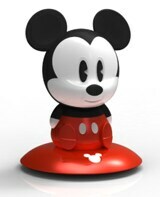 Perfect night time friends, the LED SoftPals in the form of classic Minnie and Mickey Mouse, as well as Disney/Pixar’s Monster’s Inc. stars Sulley and Mike, help little ones feel safe at night. The easy-to-use night light casts a comforting glow so they feel comforted when they go to sleep or wake up in the middle of the night. Creating a relaxed and soothing atmosphere, the soft and sturdy LED SoftPals are the perfect night time friends. Fully portable and safe, the lights charge on their base as they sleep, so they’re ready should children need to move around the house in the middle of the night. Just tilt to turn the small, but clever, Philips LED powered SoftPals on. Worry free, these child friendly lights feature Philips innovative LED system which stays cool to the touch. With no need to change the lamp, thanks to Philips leading LED technology, simply plug in the nook free, child friendly adapter and play. There are no small parts or sharp edges and cables are tucked away under a cable binder - Philip’s clever design keeps little fingers safe. 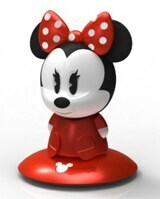 Minnie and Mickey Mouse have been inspiring children for generations; Mickey Mouse as a fun, optimistic and mischievous friend, while Minnie Mouse is the ultimate Disney leading lady. Adding a dash of monster comedy is Disney/Pixar’s Sulley and Mike who return this year for a whole new generation to enjoy, just in time for the all new film ‘Monsters University’. As well as making perfect bedroom accessories, the Philips SoftPals Range allows parents to extend the magic of Disney into their children’s day to day environment.